Recovery of Waste Oil - ! Equipment for Transformer Oil Reclamation. GlobeCore. Transformer oil – is a substance that is used in electrical devices (transformers, switches, etc.) to provide electrical insulation and heat removal. It provides thermal conductivity and electrical breakdown strength of transformer. This fact shows importance of keeping purity of oil during transportation, filling and during operating power equipment. Function of transformers is distribution of electric energy. The failure of transformer can leave entire neighborhoods without light, and even more if a failure occurs in several transformers. Analyzing the causes of breakdowns and failures of transformers, it can be noted that most of them are linked to damage of insulation system, represented by transformer oils. And it is no coincidence. Yet it is possible to protect oil against ingress of harmful impurities. 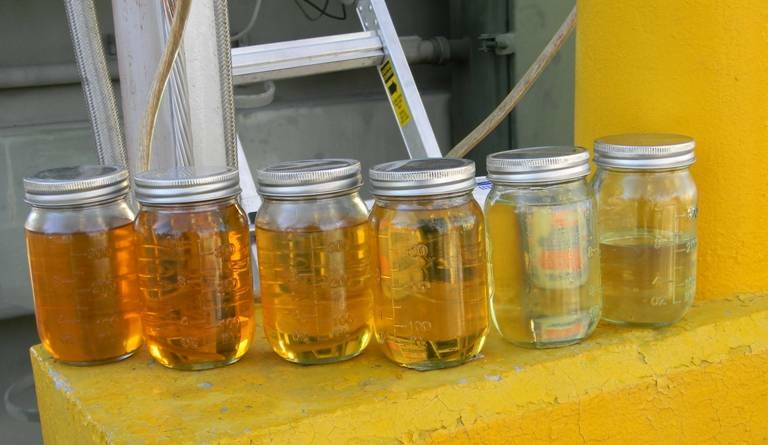 Transformer oil, like any substance, is subject to aging. Over time it accumulates impurities and oxidation products that lead to deterioration of basic performance parameters (breakdown voltage, dielectric loss tangent, the acid number, etc.). As a result of aging transformer oil doesn’t perform its direct functions. Therefore, the insulating fluid must immediately be replaced by new ones. If you don’t fill fresh oil in time, there is a huge risk of damage to important parts of transformer, which leads to failure of the entire unit. It seems that everything is clear. Collect samples, determine purity and performance. If they are not right – replace oil with a new one. But the adverse conditions in which transformers operate (high temperatures, voltage drop, etc.) can cause frequent change of oil. The result is an extensive financial cost on purchasing fresh oil, and storing used oils accumulating in warehouses. Waste products still are a big ecological problem not resolved fully. Therefore it is necessary to solve the problem of disposal of used oil. At present, used transformer oil is used as a heating oil or grease for weapons. But that can not completely stop the ever-increasing accumulation of waste in warehouses. Competent managers keeping up with the times, found a solution to this problem, which turned out to be oil restoration. Now you do not need to spend money on buying fresh oil and disposing of the old one. With proper care, transformer oil can serve a long time, extending life of transformers for decades. GlobeCore is one of the world’s leading manufacturers and suppliers of oil recovery equipment. CMM unit restores performance of insulating liquid to the level required for further use. The combination of both classic and innovative technologies makes recovery of used oil on CMM effective and long lasting. After regeneration the oil is stable to oxidation. Service personnel monitor operating parameters during the process on a mobile station CMM. With GlobeCore equipment you can save significant financial resources and increase reliability of the electrical equipment. Therefore, calculation of viscosity always remain an important part of any examination of working fluid, and generally require an average value (high, moderate, low) for both matching functions of transformer oil. In practice, it is also very important to calculate viscosity rate at low temperatures to work in the Far North. It is very complicated to determine experimentally. Thus, density of transformer oils is a major physical characteristic, because its equation includes a calculation of other parameters. And just as oil depends on the density of the feedstock, the further characteristics may depend on density values, thereby simplifying procedures and examinations of transformer oils.